Our town has become famous around the globe as one of the best wind and water sports locations. So where did this stellar reputation stem from? 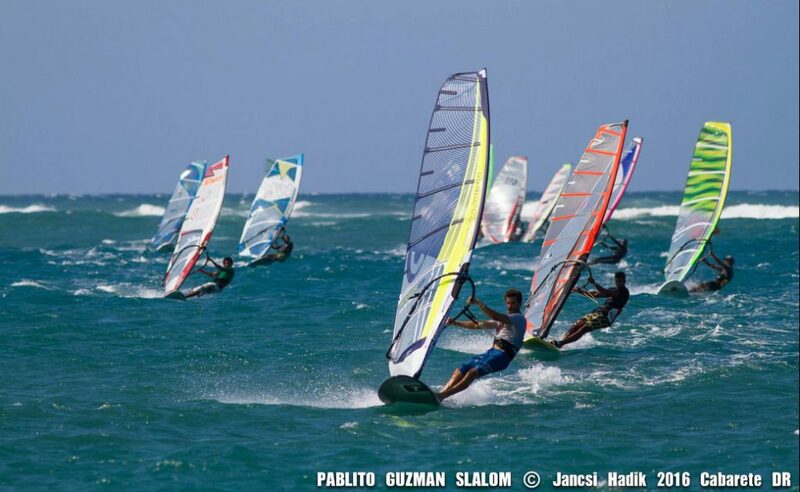 It all started with windsurfing in Cabarete. It all began back in the 1980’s when Hawaii was the place to be for all watersports. However, the long and expensive flight became a problem for Canadian windsurfer Jean Laporte who began to search for somewhere closer to home to train. It was his travel agent who suggested the Dominican Republic and after spending 30 minutes unable to locate it on a map, he put his faith in his agent and booked himself flights and off he set. After exploring the south side of the island and finding himself disappointed with the conditions, Jean and his travel partner spoke to the local fishermen who were able to inform them of the usual wind direction. Immediately Jean’s windsurfing nose twitched as he realised the north coast was the perfect spot with the possibility of perfect side shore starboard tack sailing. They were welcomed into Cabarete by the friendly locals accompanied by a Presidente beer, of course, and it was as they were enjoying a cold one they noticed the wind and waves picking up. They hopped in the car and followed the road further round and that was the moment Cabarete Bay was discovered as a wind sports masterpiece. After 17 years of windsurfing being around, Jean couldn’t believe he had found this virgin spot. He was well travelled and had visited most of the U.S, Europe and a mix of islands and he had never seen all of these impressive conditions in one spot; Progressive winds, a coral protected beach, a light current that pushes you back towards the beach and no ocean predators. After creating quite the audience of locals on the beach and having an incredible session all to himself, Jean wrote an article for Voile Libre (a French Canadian sail board magazine) and within 6 months, half of the world’s windsurf community knew about the wonders of Cabarete. Since then, this was small fishermans town has turned into a watersports heaven luring in watermen and women from all corners of the globe and has held many prestigious windsurfing competitions. Read more about Villa Taina’s role in the history of Cabarete Windurfing. So when is it windy in Cabarete? It’s windy pretty much every single day thanks to our thermal effect. Our bodies definitely appreciate those rare non-windy takes to have a much needed rest. Of course, we have seasons that are windier than others but on the whole you will find wind year round. The strongest most consistent winds are found in the summer months from May until the end of August with November being the least windy month. Cabarete Bay is every windsurfers dream with protected flat waters inside the reef, perfect for slalom, and incredible peeling waves on the reef to play in. It truly is a spacious, big kids playground. 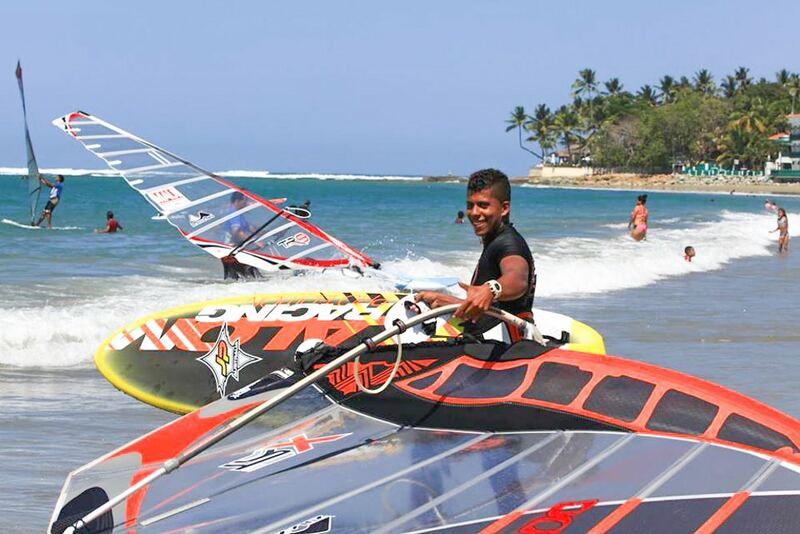 Whether you’re looking to learn, brush up on your skills or rent or buy equipment, our on-site school Cabarete Windsports Club has you covered. With Cabarete becoming increasingly popular amongst all water users such as sailors, kitesurfers, surfers, stand up paddle boarders and more, there are some guidelines and right of way rules to keep everyone having a fun time. Overtaking person needs to avoid collision – When two windsurfers are on the same tack, the faster one with the intention to overtake needs to give way and avoid collision with the slower sailor, as they will be unable to see the overtaker behind them. Downwind over upwind – Same scenario with two windsurfers on the same tack, the downwind sailor will have a hard time seeing the one upwind, therefor the upwind sailor needs to give right of way to the downwind sailor. Port bow over starboard bow – If two windsurfers are headed straight towards eachother, the one with the left hand nearer to the boom must give way to the other sailor. However it is still every water users responsibility to avoid collision, so always remember to use common sense and courtesy. Send us an email if you are interested in Windsurfing lessons.